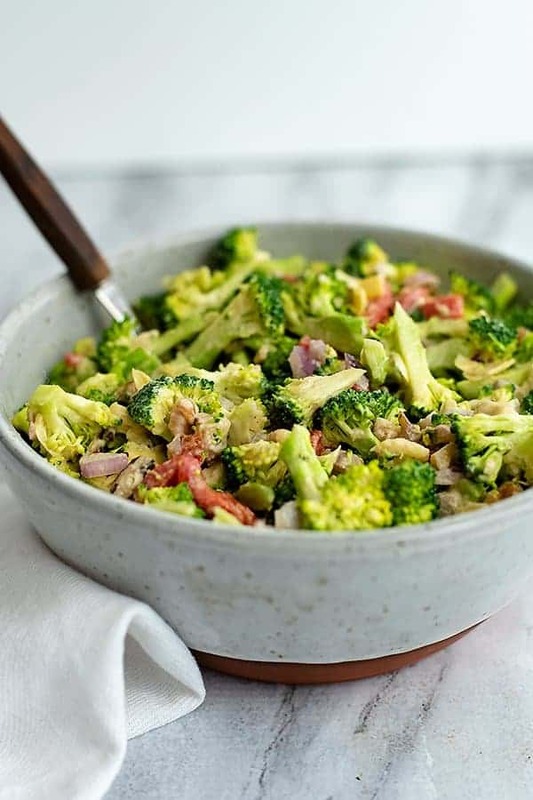 Crunchy broccoli salad with lemon tahini dressing is a simple healthy twist on a classic dish! 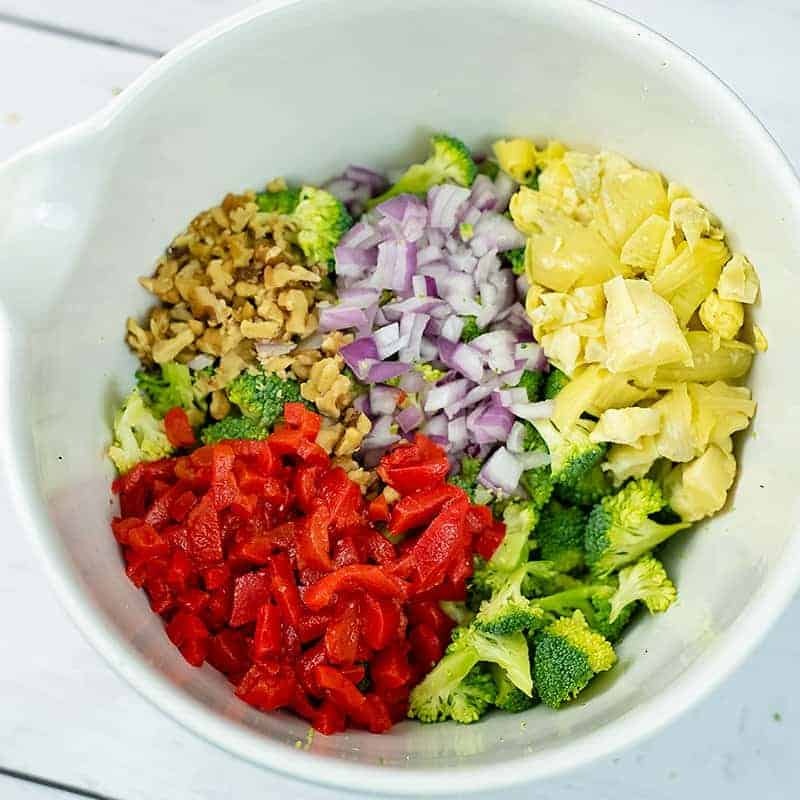 This simple salad only has 9 ingredients and takes 5 minutes to make! 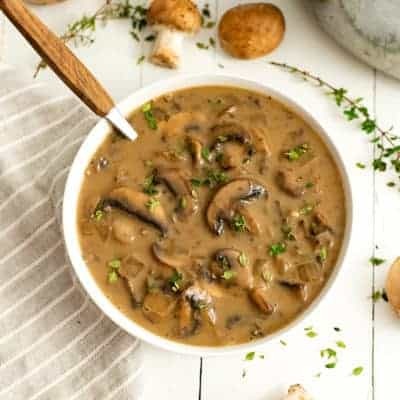 Vegan, gluten free, dairy free, paleo, low carb, Whole30 and keto friendly! Perfect for weeknight dinners, cookouts or meal prep! 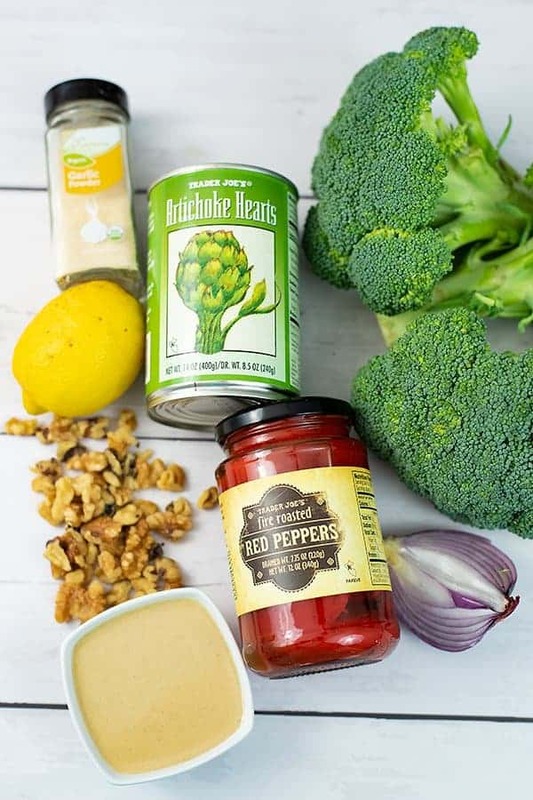 This crunchy broccoli salad combines fresh veggies with chopped walnuts and a lemon tahini dressing that is unbelievably good together. You are going to want to make a double or triple batch of this salad and enjoy it for leftovers all week! What ingredients are in the Crunchy Broccoli Salad? 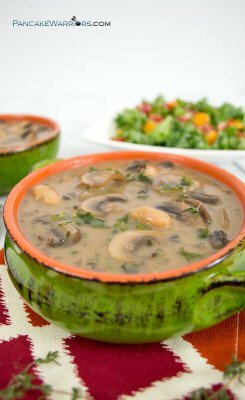 What ingredients are in the Lemon Tahini Dressing? 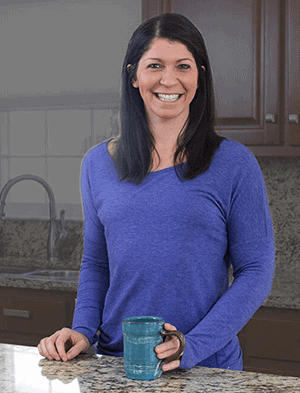 How do you make Low Carb Broccoli Salad? To make the crunchy broccoli salad, simply start by chopping the broccoli florets into bite size pieces. Add them to a large bowl. Chop the red onion, roasted red pepper, and canned artichokes (drained) into bite size pieces. Add these all to the broccoli florets in the bowl. Coarsely chop the walnuts, making sure the walnuts are big enough to add texture but chopped enough so they are easy to disperse throughout the salad. 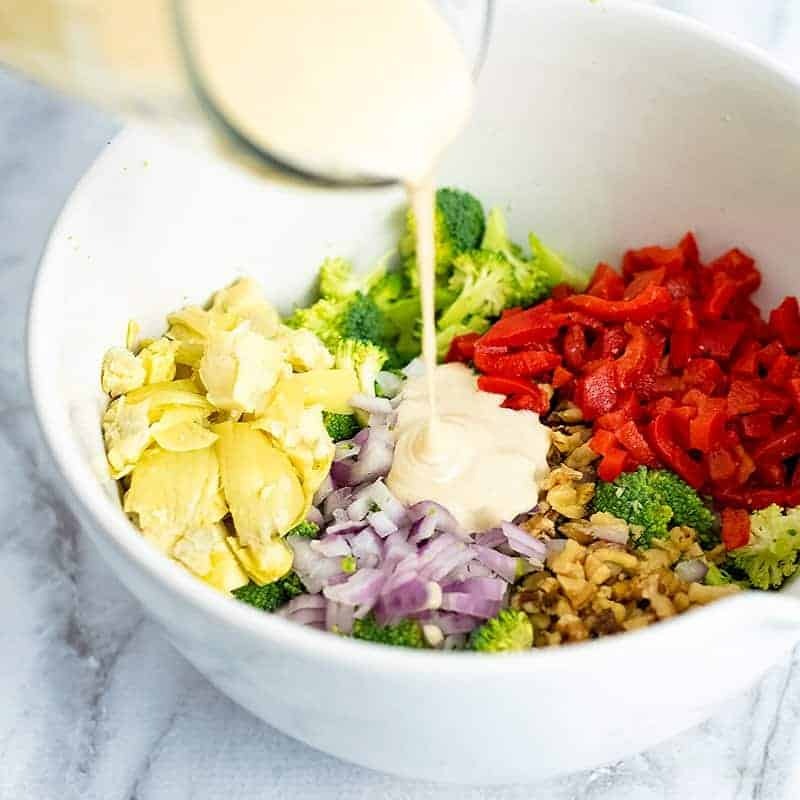 Make the Lemon Tahini Dressing and pour it over the broccoli and veggies. Combine the tahini, lemon juice, water, garlic powder and salt in a glass jar. Stir well until fully incorporated. The lemon tahini dressing should be thin enough to pour but not so thin that it’s watery. 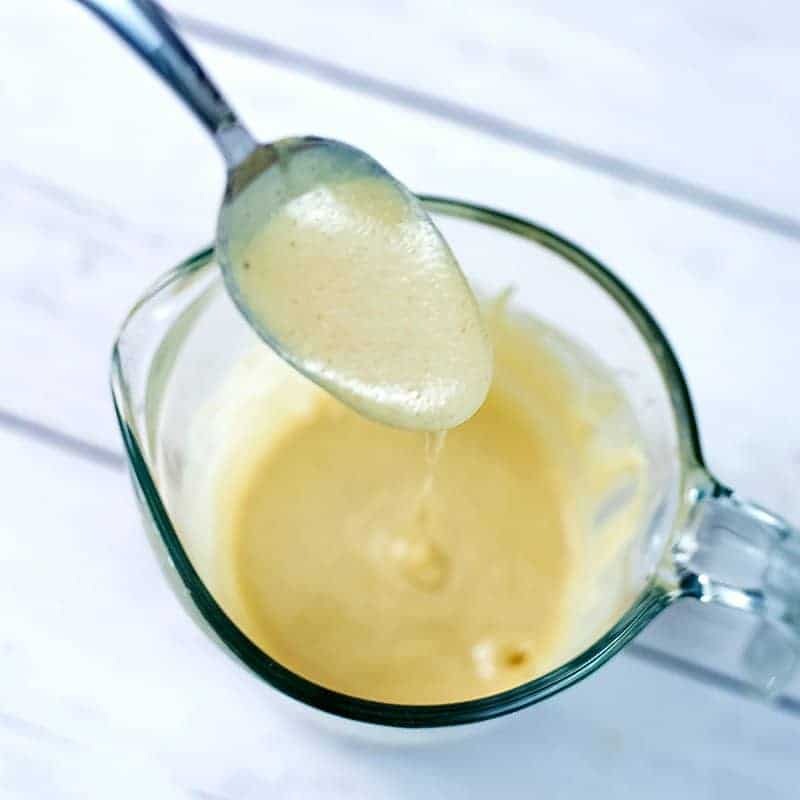 If the dressing is too thick, add 1 tablespoon of water at a time until reaches desired consistency. If the dressing is to thin, add 1 tablespoon of tahini at a time until reaches desired consistency. Watch how easy this broccoli salad and tahini dressing comes together! How long does this Crunchy Broccoli Salad last? 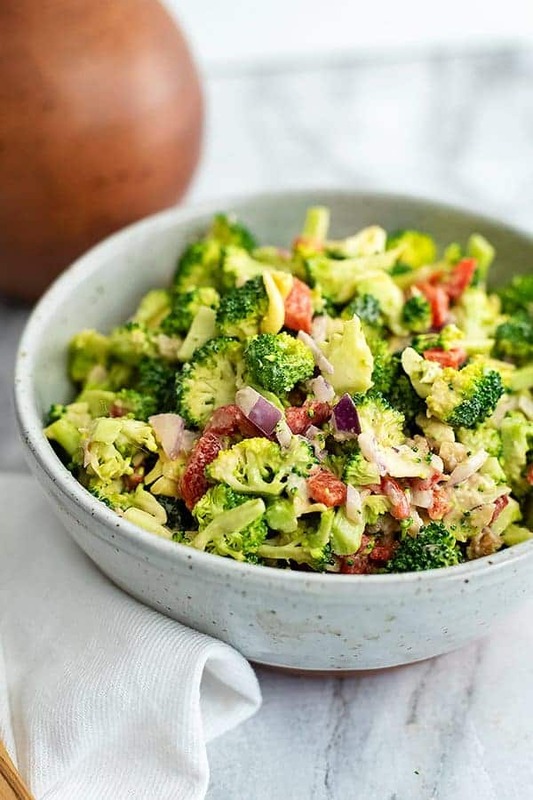 This crunchy broccoli salad with lemon tahini dressing is the perfect side dish for weeknight meals, family cookouts or even meal prep! This salad should last 3-4 days in the fridge after the dressing is added, so it’s perfect to make ahead of time! This salad can easily be doubled or tripled and can withstand being out in the heat because there is no egg or dairy! 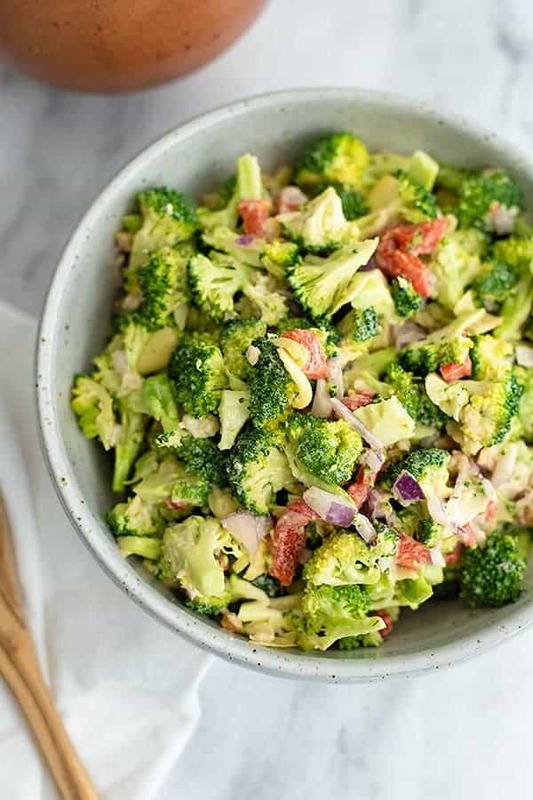 How to make this Healthy Broccoli Salad a full meal? 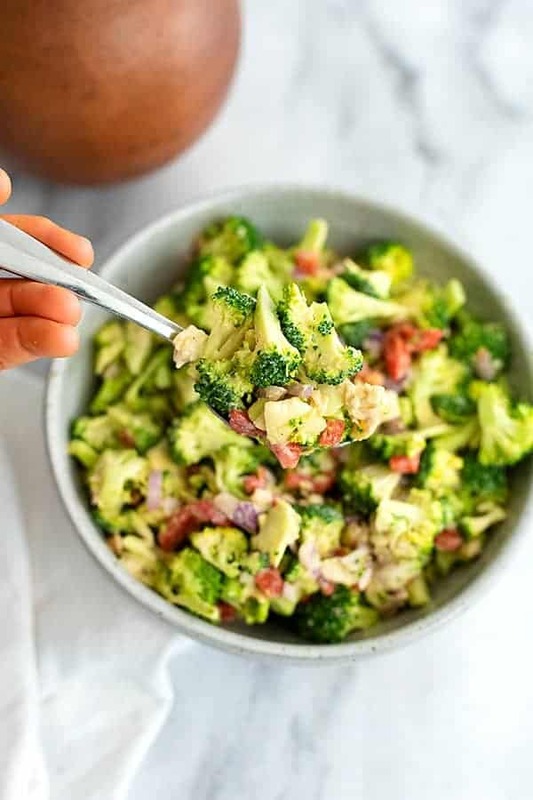 Chop the broccoli into bite size pieces and add the broccoli to a large bowl. Chop the red onion into a small dice so that it easily incorporates without being over powering. Add to the broccoli florets in the bowl. Drain the water/liquid from the roasted red pepper and artichoke hearts. Chop into bite size pieces. Add to the broccoli and red onion. Chop the walnuts into small enough pieces that they are easy to distribute in the salad but not so small that they lose their crunch. Make the dressing and stir it into the salad, combining well. Combine the tahini, water, lemon juice, garlic powder and salt in a jar. Stir well to combine. See post for instructions if too thick or too thin.